Item Size: 5 1/2" x 14"
This clever and uniquely designed windshield marketing stickers for automotive dealerships looks great and will save your dealership money. Digicals Stickers are designed to allow you to personalize (customize) each sticker by simply marking out the lines to create the numbers you want with any black permanent marker. The flexibility of this feature saves you the expense and trouble of keeping dozens of different pre-printed windshield sales decals in-stock at your dealership. Digicals Stickers can be "customized" for each car on your sales lot. 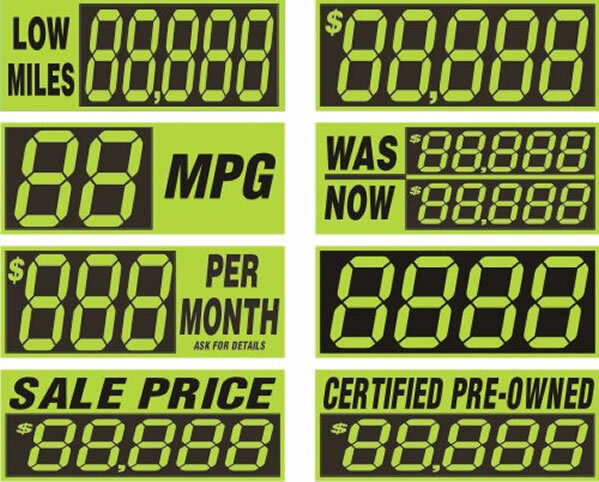 With such signs as "PER MONTH" and "SALE PRICE" ( 8 different designs) available for you to customize, the Digicals Sticker may be the only windshield marketing sign you'll ever need to buy. You can conveniently order multiple sets of DigicalsStickers WITHOUT leaving this page: Only when you've finished adding different Digicals Stickers to your order do you need to click "View Your Cart" to checkout. Enlarge theimage to view the complete set.